Valerie Khoo is the entrepreneur that you want to listen to. For starters, she’s the CEO of the Australian Writers’ Centre, as well as a successful author and journalist with two prolific podcasts, So You Want To Be A Writer and So You Want To Be A Photographer. On the latest episode of Should I Start a Podcast, Valerie digs into the benefits of using a podcast to build up your brand. She covers how it is a brilliant networking tool, that each episode holds a treasure trove of lucrative opportunities and how your audience is your key to quality content. Here are some of the highlights featured in the episode. Transcription is an understated gem to the podcasting world. Unbeknownst to some, you can make a very tidy side income as well as take a huge chunk of effort out of creating marketing content, just from dipping into your episode transcripts. Valerie explains that with just one hour of transcribed audio she is able to get her podcast show notes, at least three blog posts, three articles, and sometimes by combining a couple of podcasts together, an eBook. That’s a huge payoff for such a simple investment. Banking your transcripts into a database also ensures you have easy access to hundreds of hours of material. You can simply pick up recurring themes from episodes, and adapt them into online courses for your eager listeners. 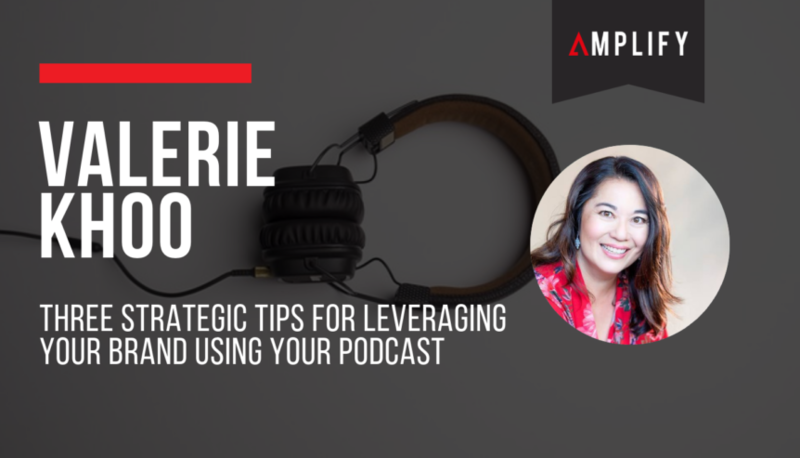 “Improving the quality of your content is one of the key ways in getting leverage from your podcast,” Valerie states. If things aren’t quite working in your favour, then why not change them? Your podcast should reflect the need of your audience, so one way to know where to improve, is to look into your reviews and ratings section. You can also ask for feedback from your peers, you never know it might be something as simple as changing your audio equipment. Another way Valerie improves her podcast is to take some time listening to other top podcasters to see how they do it. They just might have a format that will work for your brand too. Networking is the boon of any business, so having a valuable asset such as your podcast in your hands, gives you a gateway to boosting your presence amongst your peers. Interviewing is the top way you can enhance your podcast’s content, increase your knowledge within your niche and get you out to an untapped audience you may have otherwise missed. Find relevant influencers – who aren’t competitors – within your niche that can bring value to your podcast, your audience and you as a professional. A word to the wise, make sure you return the favour, leave a review or promote them on your show. Share the love! If you’re committed to your podcast, there is no end to the business benefits that can come your way. To hear more insights into building your brand, listen to the full version of the podcast here.